6.finally i upgrade to meego(which is known to be meamo 6)in my n900. just update the new software PR1.1 took about 45mins via wifi and had no problem, about time nokia sent update to Australia. Now only if Nokia could update OVI/Nokia Suite to work with Nokia's so call flagship phone the N9 then this phone can be called a smartphone. some people like to do all there updates, music transfers and contacts with their computer so how about fixing OVI/Nokia Suite. How about in the next software update PR1.2 a FM/DAB+ Radio. People on public transport can't listen to Internet radio it cost to much and downloads costs you bigtime in Australia eg Telstra over price so call data downloads. It's been less than two months since the N9 started shipping but already now there's more than 700 third party applications for the MeeGo Harmattan platform, i.e. over 1/3rd of what has been released for the Nokia N900 / Maemo 5 since mid 2009... And that number reflects true software only, without counting all those thousands of RSS-based, Nokia-Store-Wizard-made so called "apps" flooding the Ovi store. It's just the beginning! 1. During updating the software an error appear saying that update failed. Then when I check my phone the software version had change to the latest and phone in working condition. i am truly satisfied with my N9 ..it is truly a great OS comparing to android .. MeeGo is so much good i never thought that.. android makes me confused & makes me boring too..but the feature in N9 is truely undoubtfull.. it is just great smartphone.. even this phone got awarded too from sweden..
Sosyalisth, 23 Nov 2011Official N9 Prices (Cash basis, Nokia Stores): 16GB (Cyan, Magenta and Black) PHP 24,990 ... morei just cheked it at nokia gateway. its 26k and they dont have cyan. i also ask regarding about the wp7, they say it will be out in january. anyway i dont believe in them, i prove to myself that i have more knowledge than those nokia representative, they dont even know about the polycarbonate and meego harmatan, and they swype UI. poor representatives. dks, 23 Nov 2011upcoming nokia N10. Three in one boot. 1- meego harmatan 1.2. 2- windows phone 7.5(mango). ... moredont be a daydreamer dude. 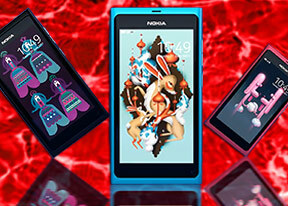 can one of happy nokia n9 owners let me know the exact 'x,y' dimensions of the screen? (yes, the diagonal size is 3.9 inches, but the x, y dimensions of the screen are not made public). iwant this design and build with a symbian belle os. Installed new PR1.1 update, about time Australia got the update. works great had to update other apps aswell overall no problem. Install took about 50mins. How about a FM/DAB+ radio in the next update. Now only if Nokia fixes OVI/Nokia Suite to work with the Nokia n9. updates and music , contacts and photos transfers maybe make this phone Nokia's flagship and make this a real smartphone.